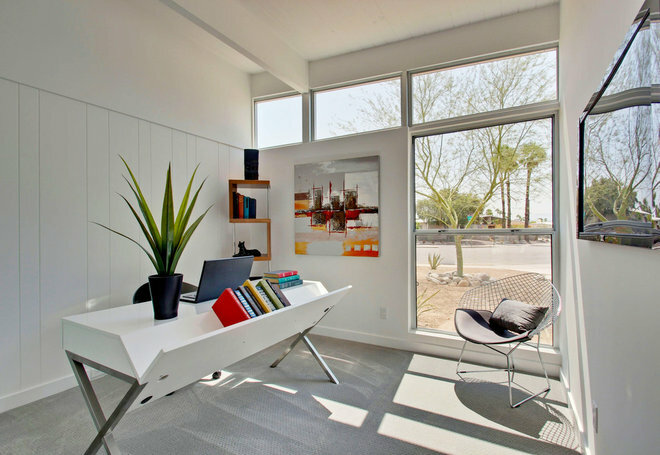 Whether you run a business from home or just use your desk for checking email, your home office has the distinct advantage of being at home. So why stick with a bland desk, when you can have a workspace that is far more fun to look at (and use)? Here are 12 ideas for desks that offer a little something more, from built-in storage to creative color. The work areas of this double-length desk are divided by an angular dip, perfect for holding a stack of important papers or a few favorite books. In a cheeky touch, the designer of this space added book-print wallpaper to the wall just below the level of the desk. A thick slab of live-edge wood makes a beautifully simple organic desktop. Here a long piece of live-edge wood provides ample workspace for two (or one who likes to spread out). Library-style card holder pulls adorn the drawers of this wood desk, which was handmade by a crafty homeowner. To get a similar look, paint just the drawer fronts of a vintage desk different hues, and swap out the handles for card holder drawer pulls (available online and at some well-stocked hardware stores). Sturdy metal storage bins act as a leg beneath this reclaimed-wood desk that’s perfectly sized for a child’s room. Open bins beneath a desk are easier to access than closed drawers, so they’re just right for keeping arts and crafts supplies close at hand. 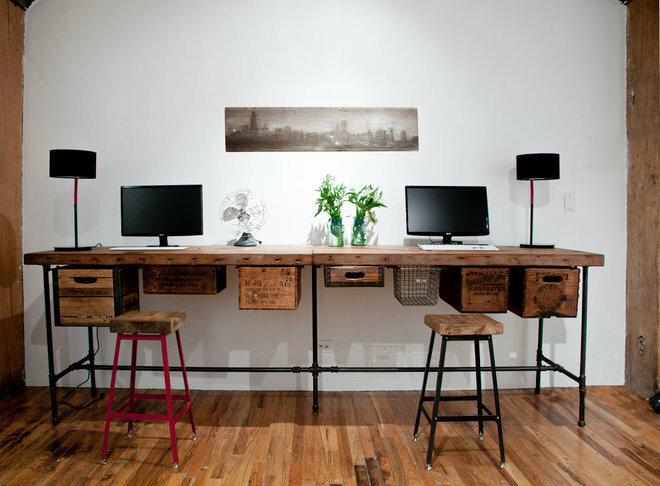 Pipes, reclaimed wood and vintage crates combine to make this one-of-a-kind double desk. When attached to drawer fittings, old bins and wooden crates find new life as functioning desk drawers. Have an awkward corner to fill? Consider having a desktop custom cut to fit the space. A corner (especially with a window) can make a cozy spot for a desk, and you can feel good knowing you’ve put every inch of space to work. If you love to read or need to keep materials close by as you work, a desk with a built-in shelf could be just the ticket. A V-shaped shelf runs along one side of this sleek modern desk, providing ample room to keep favorite books within arm’s reach. Looking for an ultrasimple, space-saving option? Try using a wall shelf as a minimalist standing desk. Pair the “desk” with a stool you can perch on when you need a break from standing, and add a few other shelves if you need room for storage. 9. Desk with a view. If you love to gaze out a window while you work, a custom work surface designed to be attached to a large window can make a serene spot for working, writing or pondering. Just be aware that a window that gets indirect sun is best if you want to avoid screen glare. Give an old desk or breakfast table a new lease on life with a few coats of glossy color. 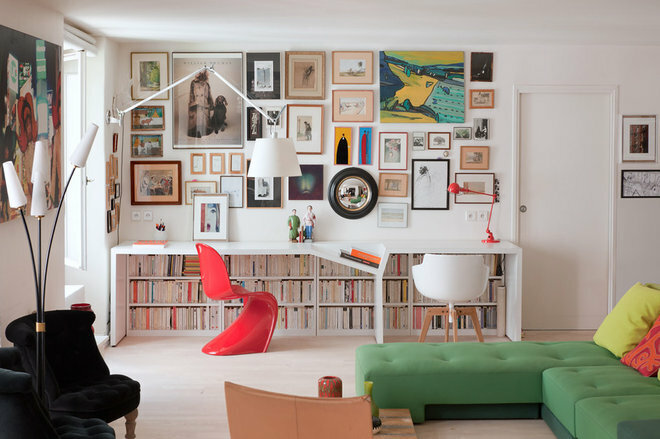 If you have the luxury of an entire room devoted to a home office, consider using a larger table (even a dining table) in the center of the room as a desk -- it will allow for plenty of room to spread out and will keep the walls free for storage and seating. 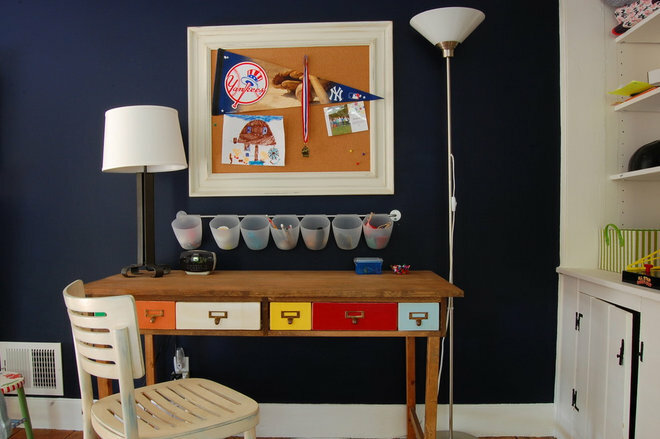 Make the most of a compact nook with a custom-fit floating desk and a coat of chalkboard paint on the walls. To get even more function out of the space, use magnetic chalk paint so you can write notes and easily post photos and important papers. Proper lighting is essential for working, but that doesn’t mean your only option is a bent-arm task lamp. Walnut paneling that wraps from wall to ceiling and recessed lighting give this workspace a warm glow. In an open-concept space, lighting controlled by a dimmer switch over the desk can help illuminate the area when you need to work and recede from view when you’re not working. Tell us: What does your workspace look like?